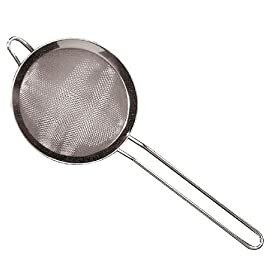 What do you guys use for a tea strainer? I used to use the cloth bags from Teavanna but don't really shop there anymore. I think they work pretty good but alot of times I would see particles from the bag in my cup of tea and thats not my cup of tea. I tried a mesh ball that encloses the tea but it broke after a couple cups. I might try reusable bags next from Earthfare. Anybody use that tea infusion system Teavanna sells? Re: Tea Strainer What do you use? I use an electric kettle to heat the water, and then brew in the IngenuiTea. I don't like the idea of microwaving plastic even if they say it is safe. I will probably try out their ceramic pot, "PersonaliTEA" next order from them. Last edited by OHMatt; 12-20-2009 at 07:11 PM. Sorry. I brew in a gaiwan or yixing. No strainers for me. That being said, back when I did, there are little food strainers in the shape of a bowl with a stem that can be fit on larger mugs. I found these work as well as anything. I use a tetsubin most of the time and it has a strainer it came with. If not, then I use a mesh ball. I've never had a problem with one. Try a sock! When you use a gaiwan do you drink from it with the loose tea in there? Or is it easy to pour into a mug. For some inexpensive green, I'll actually do it the old chinese peasant way and drink from the gaiwan. Can you recomend a good site to buy a gaiwan? I want a Yixing clay one. Last edited by Steelergar; 01-28-2010 at 05:18 PM. his teas are also pretty decent if you go that route. Note that he does not have yixing gaiwans. My bigger question is; are you sure you want a yixing gaiwan? Yixing holds nigh mythical properties for improving the taste of tea, however, to do this, it is essentially absorbing some compounds in the tea brewing process. I do own several yixing pots, but I dedicate each to a specific style of tea. To have a yixing gaiwan (which I consider the knock around do all of the tea world) to brew various teas is somewhat self defeating as a "trace" of each of the previous beverage infusion remains. I'm not trying to talk you out of it, just making sure that that's what you want. Yixing gaiwans, while available are not easy to track down, and I don't have a good source off the top of my head. Also, since this isn't a tea board, and I need not fear getting flamed three ways to Sunday, I'll timidly say that I think that yixing is one of the most overrated products on the face of the earth. Sure, the hundreds of years old ones are awesome if you're a bank robber, but the new ones are just clay IMHO. What do you think brews a better cup of tea than, a small or large gaiwan? They do equally well. My choice depends on the price of the tea. Everyday goes in a large one, stuff that costs me $20/ounce goes in a little one. I just picked up a gaiwan from teavanna, the only place locally that carries them. retail was $16.00 but it was on sale for $3.95. Something has to be wrong with it unless they are totally unpopular because people buy those new fusion tea sets. A deal is a deal! Well met!. I carry an assortment of gaiwans. However, they are not usually made using just Yixing clay. A gaiwan is usually made using either porcelain or another ceramic glaze. This is so that the gaiwan does not retain the tea oils of specific oils. Yixing clay teapots are unglazed and are meant to hold the tea oils of the specific tea that you infuse in them. Therefore, you only use a Yixing that you started to use for oolong tea for only oolong teas forever. So, you may have a Yixing teapot for oolongs, one for ripe pu-erh, one for raw pu-erh, etc.